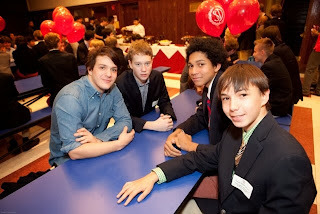 A chilly, driving rain didn't deter a record number of alums in secondary school and our current eighth graders from attending last night's Young Alumni Chapel talk and Dinner--a Thanksgiving tradition that provides an opportunity for our eighth graders to share an evening with alumni who are in high school. 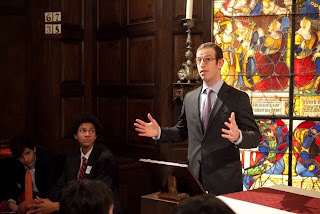 In his Chapel talk, which opened the evening, Lucas Jenkins '04 focused on the meaning of the school's motto, our mission's ultimate aspiration "...that they be good men." Addressing the Class of 2014, he said they had "a great opportunity to be school leaders" in living the mission. Lucas then reminded the young alumni present of their "privilege and responsibility to represent the school, to carry its motto and live up to it on a daily basis." He also noted that oftentimes making the right choice, or doing the right thing, isn't easy, and that "a good man acts accordingly, not when it is expected, but when it is difficult to do so." 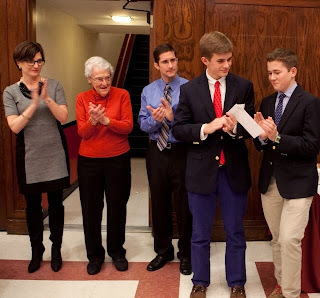 Afterward, we all enjoyed a pre-Thanksgiving dinner in Hyman Hall during which former Student Council Presidents Skakel '13 and Jack '12, presented Anne Marie Fox and Josh Springer, representatives from Save the Children, and Mimi O'Hagan, of Mimi's Building Blocks, with a check for $37,000 representing the money the boys worked hard to raise during the third year of Saint David's school-wide project to build an elementary school in Ethiopia. 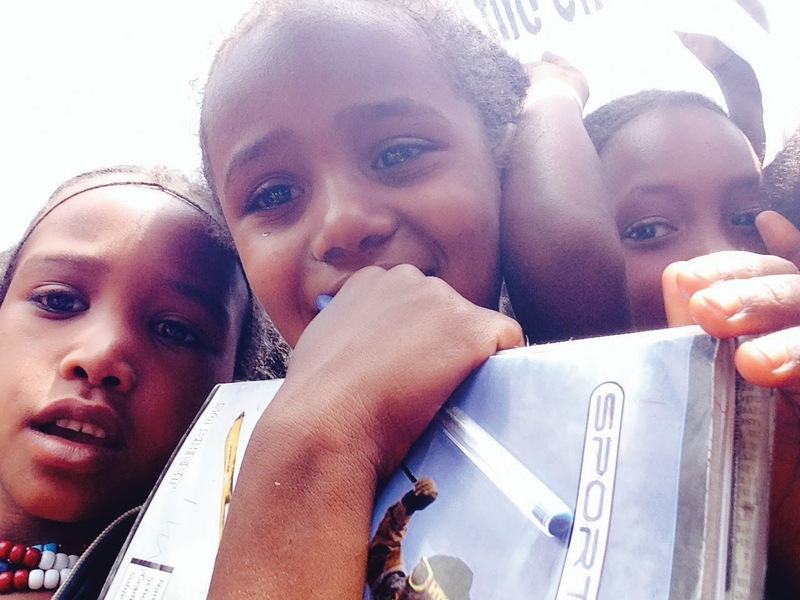 Fully funded, The Saint David's Kalina School opened in September. Anne Marie and Mimi, who recently visited Kalina, spoke of the excitement and joy the community has for their new school and of their deep appreciation. 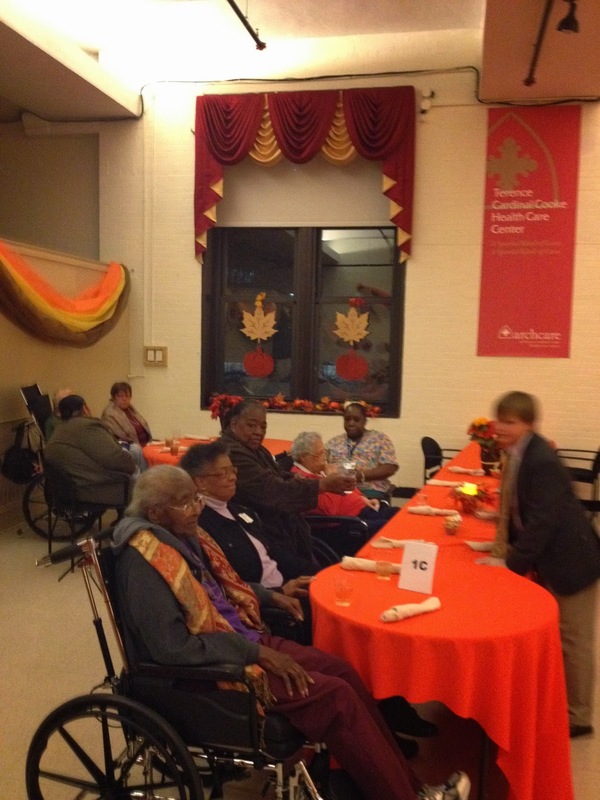 Said Anne Marie: "You gave them the gift of opportunity, they give you the gift of gratitude." What a beautiful truth and wonderful Thanksgiving message for our boys! 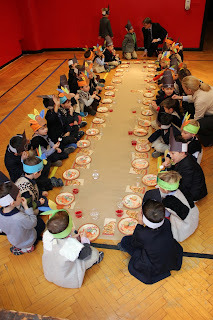 Pre-K "Native Americans" and Omega "Pilgrims" shared a Thanksgiving Feast this morning. The event began with the Pre-K boys saying a prayer of thanks and Omega boys reciting a poem about "The First Thanksgiving." The boys then got down to business: enjoying their feast of popcorn, cookies, and pretzel/marshmallow peace pipes! In their respective classes, the boys have been learning about the history of the upcoming holiday. In addition to building on what they have learned, this was also an opportunity for both classes to build their own sense of community through a shared experience. Our Omega boys represent the leaders of the first floor, while our Pre-K boys are our youngest. Below is a short video excerpt of part of the feast. 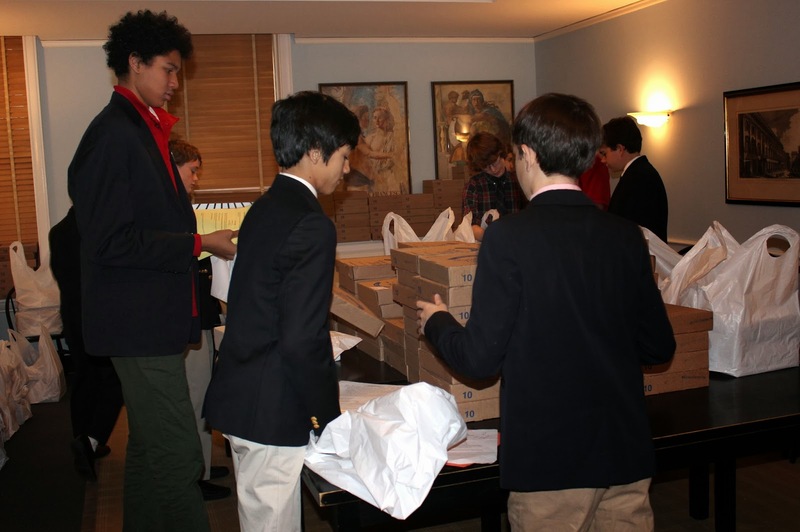 Eighth grade boys are busy today organizing pies and canned goods that comprise our annual school-wide Thanksgiving Food Drive. This year, the boys sold 613 pies — an all time record — to raise money for the purchase of 100 turkeys that will be delivered, along with the food from the canned goods drive, to families in need on Wednesday. The food will be delivered locally to Incarnation Church, as well as the churches of two of our staff members: Bethel Gospel Assembly and Lion of Judah. 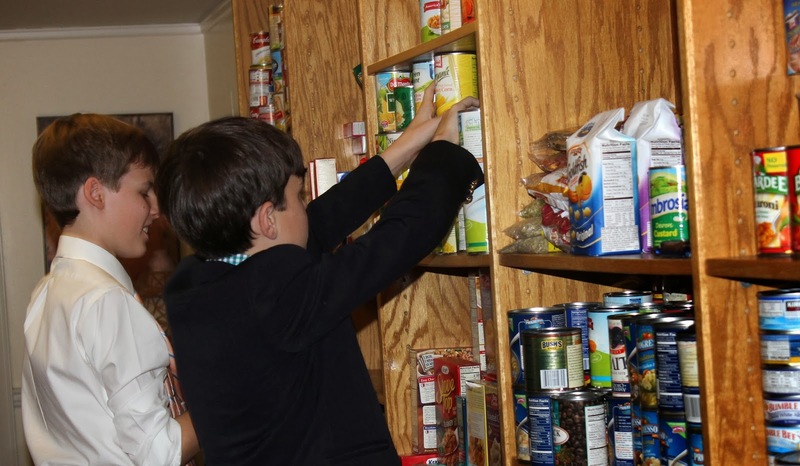 The Thanksgiving Food Drive, our school's oldest community service project, is a month-long effort spearheaded by the eighth graders and their teachers Tom Ryan and Gene Romanosky. In gratitude for our many blessings, the project represents a commitment on behalf of Saint David's to the greater good and to giving back. During the winter, Mark K. Shriver, author of A Good Man: Rediscovering My Father, Sargent Shriver, will be speaking with the seventh graders and their fathers at a new special annual event. We have invited Mr. Shriver to Saint David's to discuss his book over dinner and share his extraordinary father-son relationship with an audience of Saint David's fathers and sons. The father-son relationship is a unique and special one. Saint David's has added this event to its "curriculum" in an effort to explore on an annual basis "what it means to be a good man" and other mission inspired themes and topics around manhood, fatherhood, and "sonhood," at a time in the father-son relationship that is both timely and apropos--the seventh grade. Excerpt from the publisher: "In this intimate portrait of an extraordinary father–son relationship, Mark K. Shriver discovers the moral principles that guided his legendary father and applies them to his own life." Mark is the senior vice president of U.S. Programs at Save the Children in Washington, D.C., and a former Maryland state legislator. He lives with his wife and three children in Maryland. We look forward to his visit later this winter. There's a lot of STE(A)M right now at Saint David's. Seventh graders have been thinking 3-dimensionally, designing, creating and printings bookmarks using the 3D printer and first grader boys have been busy with Lego WeDo Robotic Kits. For the seventh grade project, boys had to critique the form and function of an effective bookmark, and explore the way a 3D printer prints (by adding layer upon layer) in order to execute a successful bookmark design. They were challenged to incorporate three-dimensional elements into their bookmark design. 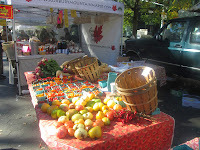 Two of the designs are shown here. One design cleverly contained the word "Library," which when viewed from behind looks like a stack of books! In addition to the bookmark design project, seventh graders learned skills employed by software developers to design and improve a selection of video games using Scratch. While our seventh graders are challenging themselves to utilize the "z" axis in one part of the curriculum, our first graders were busy programming Bee Bots to navigate a neighborhood. While their initial challenge some time ago involved simply programming the colorful Bee Bots to travel from point "A" to point "B," they are now being challenged to program their Bots to navigate in ways that involve avoiding a dog and a construction site, and stopping for ice cream along the way to its destination. First graders have also been building robots using electric motors and sensors. All of these projects involve cooperative team work, critical analysis of the many variables involved to achieve a successful outcome, and extensive cycles of trial and error. And, especially significant, they involve boys actively engaging--doing and creating with technology--rather than merely consuming it. The great Saint David's Annual pre-Thanksgiving Tradition, The Turkey Run, ran Tuesday. It was a beautiful, crisp morning at Riverside Park when the second graders arrived and began their warm-up routine. Nervous energy was palpable, and spirits were high. As the Ferrari's, Maserati's and Lamborghini's took their starting slots, the air became literally electric--filled with the hightened anticipation that typically accompanies such an exciting race and historic event. It was just phenomenal! This year's running was the 20th at Riverside and we believe close to the 50th annual running. No one currently in the school is quite certain, with any degree of confidence, of the exact start date of the Turkey Run. Was it 62, 63, or 64? If you know, let us know! Below is a short piece I captured--pre firing of the starter's gun. Sixth graders made their way up 5th Avenue Tuesday after school to join residents of Cardinal Cooke in helping them celebrate Thanksgiving. The boys set the tables and served residents, their family and friends, in what has become a great giving tradition. In addition to making conversation with residents and their families, the boys had a lot of work to do ensuring residents with special dietary requirements and feeding limitations were appropriately served and cared for. 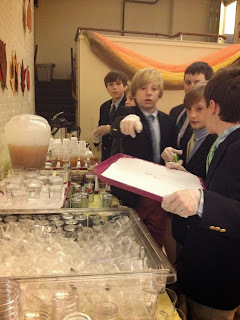 I was proud of the boys' incredible patience, good humor and flexibility in a busy, complex environment. 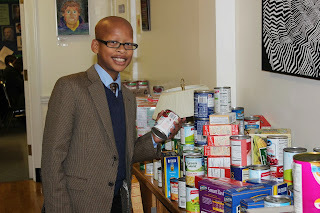 Serving the greater good is an important component of a Saint David's boy's education. On Tuesday it blossomed. Alex '13 dropped by to say hello early this week. Loving his intense study of Latin and his new found passion in the Improv Club at Browning, Alex has begun making Electronic Dance Music in his spare time, with an eye to marketing it. I was also pleased to hear he's sticking with the violin and will be joining his Alma Mater on stage at Carnegie Hall this winter. 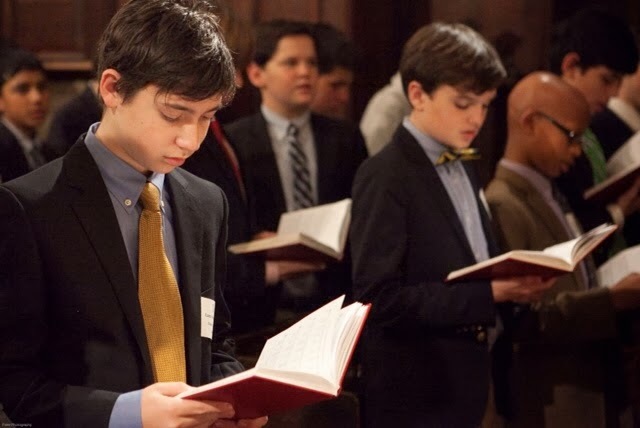 This week two classes of Saint David's boys went on field trips closely associated with what they have been studying this fall. On Tuesday, our fourth graders participated in a guided tour of the Ancient Egypt wing of the Metropolitan Museum of Art. There, museum guides engaged the boys, inviting them to look closely at and critically analyze the works of art, often asking them open ended questions based on observation. The boys have been studying Ancient Egypt as part of their fourth grade history course focusing on the question "What is a civilization?" Visiting the museum enabled the boys to engage visually with what they had learned in class. 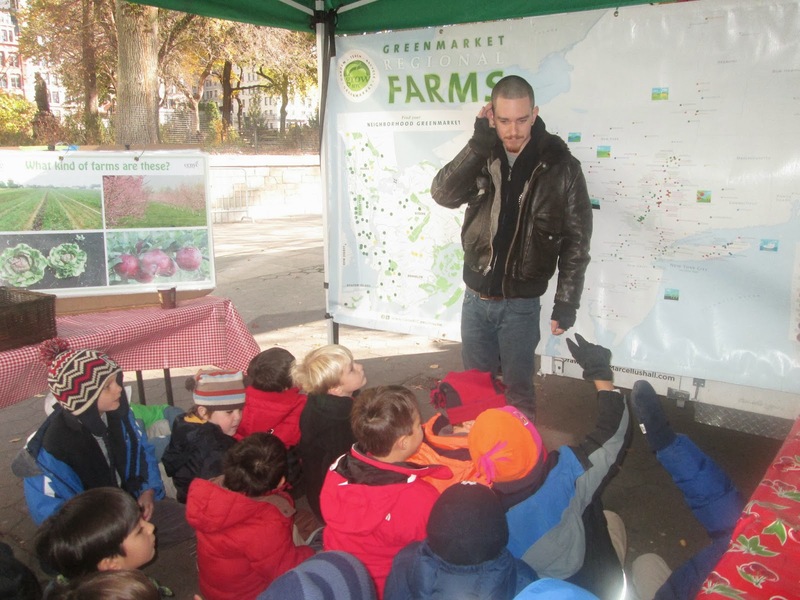 In Omega, our young boys have been learning about the importance of farming. 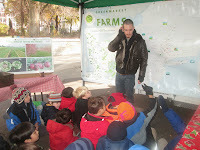 Yesterday, they visited the outdoor Farmers Market in Union Square, where they and their teachers met with the head of our catering services provider who guided our boys around the market, discussing the difference between fruits and vegetables (They were surprised to learn a red pepper is a fruit! 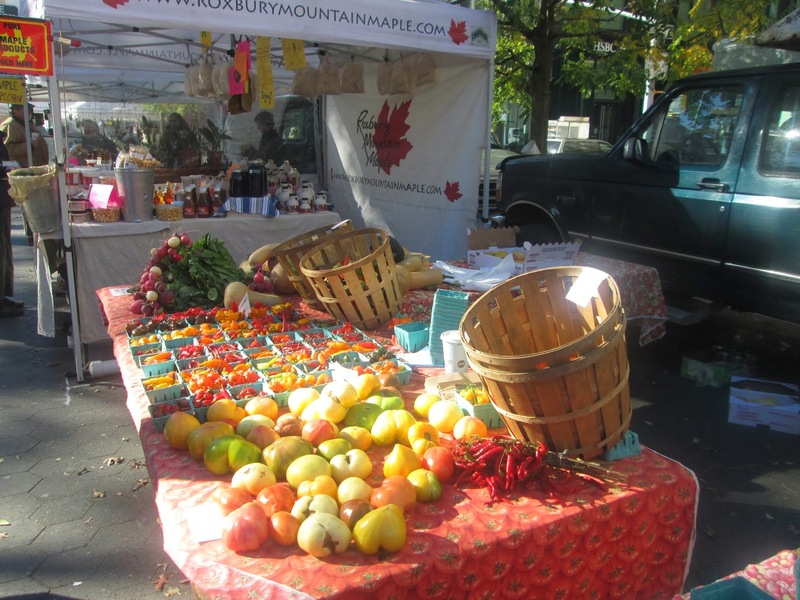 ), seasonal vegetables, and the importance of buying locally grown foods. The boys were thrilled to select vegetables to purchase for the school's next-day lunch. 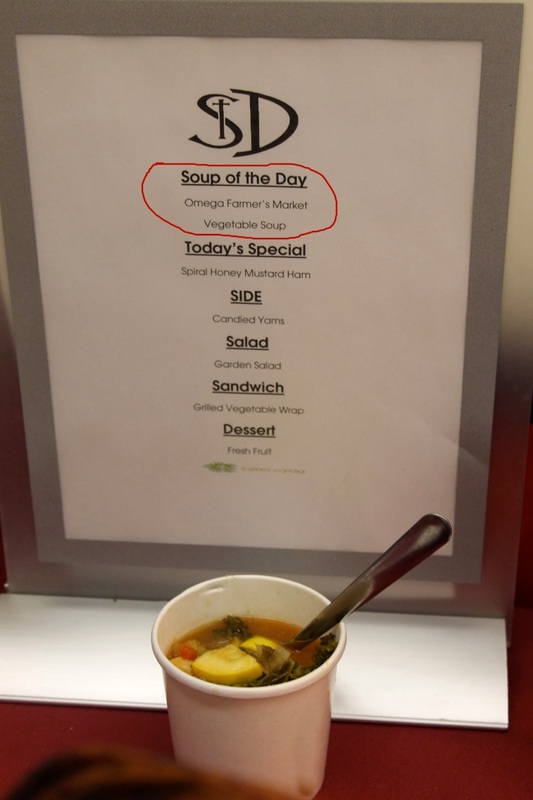 Imagine their delight when they saw the sign in the lunchroom today, indicating that the soup of the day was made from their class's vegetables! 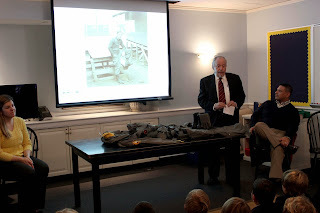 Both of these class field trips are in line with our Curriculum Initiative efforts to increase the out-of-classroom learning experiences for boys throughout all grades, in ways that enable them to make meaningful connections between in-class learning and what they see in-situ to deepen their understanding. 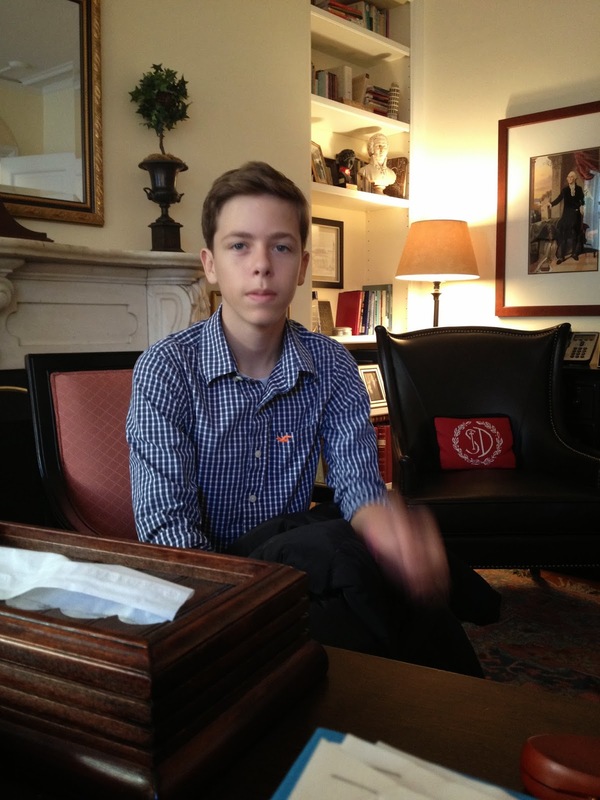 "On a Saturday, three freshmen boys approached a faculty member and turned in a large sum of money. The money was said to have been found in the meadows, dropped by some unknown individual, and was discovered by these freshmen boys: Will H. [and two others]. "Instead of keeping the money, they decided to hand it in. This act displays great self-control, as well as admirable honesty. When asked about their mindset when they found the money, they reflected upon how they only thought about finding the nearest dean or faculty member and never even considered taking the money." Congratulations, Will for flying the flag so high. Boys build and revise wind turbines as part of our study of simple machines and energy. The boys were so excited to see their machines come to life--so much more engaging and real than only the printed word of the text--a balance of both "essential components" is what we are aiming for. Incorporating more engineering into our curricular offerings is a major theme of the year. On this day when we remember and honor all who have served and sacrificed for our country, two veterans spoke to our second graders about their service. 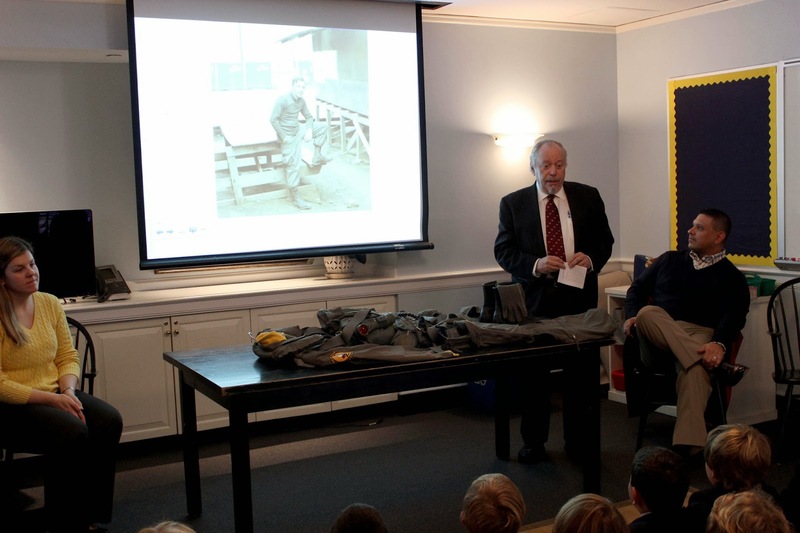 Jack Sproule, Director of Finance and Administration, spoke of his time in the Vietnam War; Cesar Sanchez, husband of second grade teacher Courtney Sanchez, presented on his two deployments with the Navy on the USS Constellation, an aircraft carrier deployed in the Persian Gulf. Not present, but also honored, was former master teacher (and now development associate) Tom McLellan, who served in Korea. The presentation was followed by a question and answer session, and the boys were encouraged to talk about Veterans Day with their families this evening. Later in the day the boys wrote letters to Mr. Sproule and Mr. Sanchez, posing further questions and also expressing their thanks. On Election Day, Saint David’s faculty attended a series of dynamic hands-on workshops, led by members of the tech department and fellow faculty, related to the incorporation of technology tools into their classes. Faculty were introduced to new digital tools, which they had the opportunity to explore hands-on. They discussed how their students might use these tools in ways that could make learning more efficient and/or deepen student understanding. Among the sessions was one on 3D printing with the MakerBot Replicator, a 3-D printer. During this workshop, faculty experimented with manipulating two-dimensional shapes into 3-D and learned the steps to print an object or design from the computer to the MakerBot Replicator. A particularly lively session on iPad apps included Sonic Pics, which allows you to take photos and record your voice over the photo to create a story or provide an explanation. Teachers experimented with the app, creating their own visual/audio narratives, and discussed how these might make for great projects, especially in the lower school reading classes. In addition, there were workshops on online research and databases; and Scratch, a visual programming language developed by MIT, which enables users to create interactive stories, games, and animations. Teachers explored examples of Scratch projects and made their own simple interactive project relevant to their subject areas. At the same time as these technology related workshops were taking place, our athletics coaches met to discuss the Positive Coaching Alliance workshop they participated in earlier this fall and to plan and refine the upcoming winter sports season. Today's sessions underscore our commitment to professional development of faculty at Saint David's, STE(A)M initiatives, and our yearlong theme of critical analysis. I have great news to report! Last month, after three years of fundraising and more than a year of construction, our school in Ethiopia, built by Saint David's boys in partnership with Save the Children and with the support of Mimi's Building Blocks, opened. The new school welcomed 288 boys and girls in pre-school through grade 4. For the first time ever, Kalina children are able to attend school in a permanent facility with classrooms, administrative rooms, and latrines--previously they attended an open-air dass school. Their new school, The Saint David's Kalina School, uses a "one shift system" in which the children and their teachers remain in class from 8 AM through 12:15 PM each day. The new faculty includes 2 male teachers, 5 females teachers and 1 male principal. All teachers are from the local area and most have completed Save the Children's Literacy Boost teacher component training; two were trained in basic school health and nutrition. A Saint David's contingent will be traveling with me to Ethiopia this coming June to officially open the The Saint David's Kalina School. Our four prior Student Council Presidents and three members of the faculty will be making the trip, representing the faculty, staff and boys of Saint David's. A commitment to the greater good is inherent in Saint David's mission. We are thrilled to be participating in this important effort to extend educational opportunities to people in areas of need, and look forward to continuing our support for this school--a 60th anniversary initiative successfully accomplished! I visited Calhoun today with Mr. Imbelli to see Brad '10 in his senior year. 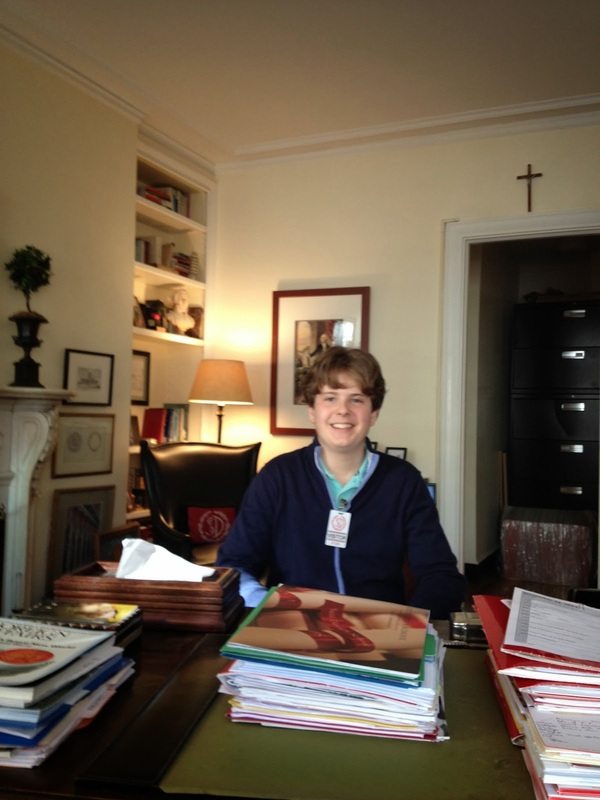 Brad is the only Saint David's alum in recent memory to attend Calhoun. He has enjoyed his time there immensely. After adjusting to a dramatic philosophical change in culture, Brad has flourished. A recent highlight Brad shared was a semester he spent at The Island School in the Bahamas, where he engaged in a science focused process of inquiry around discovering sustainable solutions to real world problems and where he participated in project-based outreach programs with the peoples of Eleuthera. Brad is looking at small liberal arts colleges in the Northeast. When I got back to school, Axel '13 dropped by to touch base. At Riverdale now, Axel has made a smooth transition to high school; he loves the campus freedom and seems to be enjoying his studies. After waiving a sport this fall, he's now looking forward to winter prep for spring lacrosse. 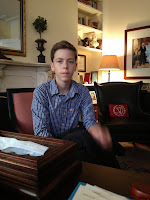 It was great to see both boys -- one just finishing up and one just starting his secondary school experiences.